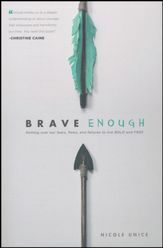 I loved Brave Enough: Getting Over Our Fears, Flaws, and Failures to Live Bold and Free by Nicole Unice! When perfectionism becomes a dictator in everyday life, when failure rears its ugly head, when going with the flow is easiest, Nicole Unice calls women to be brave and make some movement. Ms. Unice talks about how being brave is an option. Adversity is going to happen to everyone at some point it’s what we do with our adversity that makes the difference. Choosing to allow God to take the adversity we face and let those journeying steps help us to be brave. I thoroughly enjoyed Brave Enough. It’s like having a personal counselor walk you through the process and then become your cheerleader. It’s a great book for women of all ages with practical insight and advice. I received an advanced reader copy of this book from Edelweiss and Tyndale Publishing in exchange for my honest opinion.